It is impossible to visit Russia without seeing its two largest cities: Moscow and St. Petersburg. Both these cities are rich in history, art, architecture and the food is pretty good too! By taking a Moscow – St. Petersburg cruise, a ship can easily link these two great imperial cities of the czars. Moscow has a wonderful heritage of historic buildings and is known as the medieval and 20th century capital of Russia, while St. Petersburg is a dreamland of 18th century architecture and craftsmanship. Besides offering visits to sites of unique historical and architectural interest, these cruises afford a relaxing alternative to traveling by taking you along the Neva River, Lake Ladoga, the Svir River, Lake Onega, the Baltic canal, White Lake and the Volga River. Moscow: You will be met at the airport or train station by one of our drivers and taken by a comfortable car to the river port where you will board your cruise ship (transfer is OPTIONAL). Over the next few days you will have a chance to explore Moscow and learn about its riveting history. You will be taken on a city tour where you will see Moscow's most interesting sights and learn about this amazing city's past and present. You will also have a chance to do some light shopping and there will be time to relax aboard the ship in the evenings. Uglich: You will be taken to the walking city tour with visit to the Church of St. Demitrius on the Blood and the Transfiguration cathedral. Uglich was founded in 1148 as a small princedom bordering on Muscovy, Uglich is one of the most beloved towns in Old Russia. The view of the town as you approach it from the Volga River is breathtaking with the Cathedral of the Resurrection and St. John's Church rising up on the horizon. The history of the town is fascinating; At the end of the 16th century, Maria Nagaya, seventh wife of Ivan the Terrible, lived in honorary exile at the Kremlin in Uglich. It was here in her garden that the 10 year old Prince Dmitry of the Rurik Dynasty, heir to the Russian throne was murdered by Boris Godunov who wanted to seize power for himself. On the spot of his death, the Church of St. Demitrius of the Blood was built and still stands today. The death of Prince Dmitri brought on the start of the Time of Troubles, a dynastic and political crises and one of the most tumultuous periods in Russian history which ended 15 years later after the election of a new Tsar Mikhail Romanov (the first Tsar of the Romanov Dynasty). Inside the Kremlin the oldest building in Uglich, the Palace of Tsarevich Dmitry also stands. During your time in Uglich you will learn more about the town’s past and walk along the paths of Russian history. Yaroslavl: You will be taken on a bus city tour with a visit to the Transfiguration Monastery and Church of Elijah the Prophet. Goritsy: You'll tour the St. Cyril on the White Lake Monastery (territory + Treasure Hall). Kizhi Island: You'll cruise along Europe’s second largest lake, Lake Onega and arrive on the island of Kizhi. Here you will visit a fascinating open air museum containing numerous examples of elaborate Russian, wooden architecture. Mandrogui: Enjoy walking around this traditional Russian village in its beautiful setting and spending a day of rest, relaxation and fun. We will have a fantastic barbeque picnic on the banks of the river. St. Petersburg: Your time in St. Petersburg will begin with a Panoramic City Tour. This tour is the best way to get acquainted with all of the city's major highlights. Our professional guide will take you down Nevsky Prospect, St. Petersburg's most famous and vibrant thoroughfare. There you will see some of the city's most interesting architectural monuments including the Kazan Cathedral (exterior) and the Winter Palace. One of the highlights of your entire cruise will be a visit to the Hermitage, Russia's premier museum containing one of the largest art collections in the world. The museum consists of five historical buildings including the Winter Palace - the residence of the Russian Tsars. The museum contains over 3 million pieces of art with dates ranging from high antiquity to the present day. Among the Hermitage's treasures are artworks by Leonardo da Vinci, Raphael, Titian, Rembrandt, Rubens as well as many others. St. Petersburg is Russia's second largest and second most important city - the Northern capital of the country, Russia's cultural center, and considered the world's "Northern Venice" due to its extensive system of canals and islands. Walk along Nevsky Prospect and experience the grandeur of pre-revolutionary imperial Russia. Pass palaces from the past and gaze at the famous embankment of the Neva River with its numerous bridges and striking architecture. St. Petersburg is also home to Russia's largest and busiest port and with its many world class theaters and museums has a very high level of cultural life. The surcharge for single occupancy in a double cabin is 80% of the total amount for the cruise. Mandrogi Walking Tour, barbecue lunch (instead of lunch on board). Please be informed that all pre/post cruise services (additional arrival/departure transfers, hotel accommodations, additional excursions, etc.) can also arranged by us. Conditions of payment: To book your cruise a 25% deposit is required in advance. The trip must be fully paid 41 days before departure. 41 or more days before departure – a fee equal to 25% of the entire package will be charged. 40-20 days before departure – a fee equal to 50% of the entire package will be charged. This 4-deck vessel was built in Germany and renovated in Russia in 2008. The ship features 2 restaurants (190 seats and 75 seats), a bar (50 seats), and a Conference hall (180 seats). Theew is also a Reading room (28 seats), 2 souvenir kiosks and a Medical office on board. Passengers can use Laundry (for an extra charge). 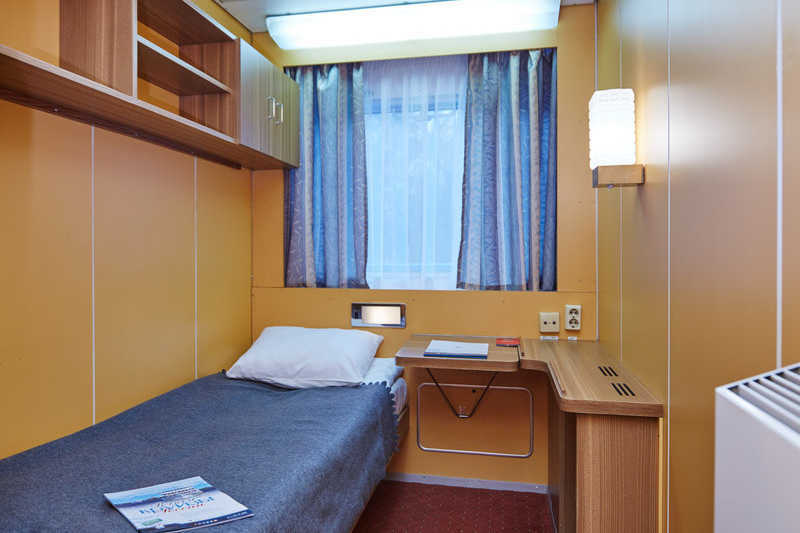 Each cabin is equipped woth air-conditioner, bathroom (sink, shower, toilet), electrical socket (220V), built-in wardrobe, refrigerator, portholes on the Lower deck, panoramic windows on all other decks. A cabin for two persons located on the Boat deck. The cabin has scenic windows, private facilities (shower), kitchenette, a double bed, a sofa, a table, a TV, and a refrigerator. One-bed outside cabin with a large scenic window, equipped with private facilities, heating and ventilation system, and a refrigerator. Cabin is furnished in a practical style. Two-bed outside single-staged cabin with a large scenic window, equipped with private facilities, heating and ventilation system, and a refrigerator. 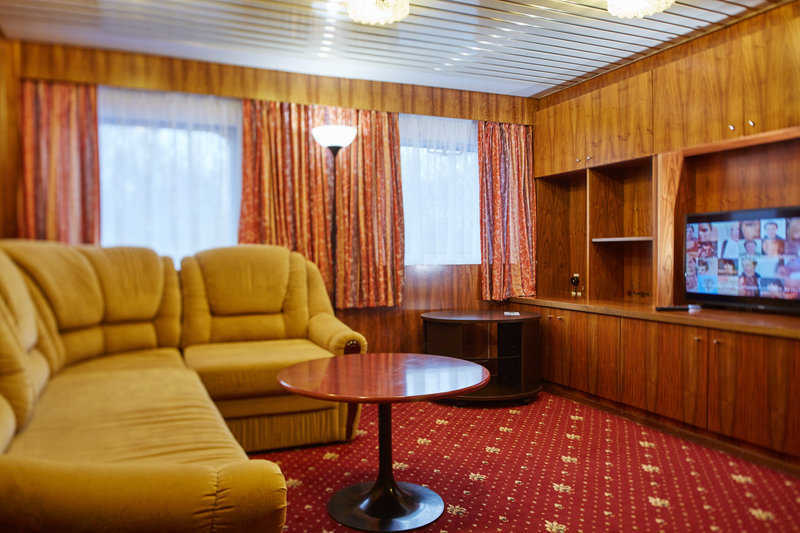 Cabin is furnished in a practical style. This 4-deck vessel was built in Germany and renovated in Russia in 2008. The ship features 2 restaurants (180 seats and 60 seats), 2 bars (60 and 30 seats), and a Conference hall (120 seats). There is also a Medical office and 2 souvenir kiosks on board. Passengers can use Laundry (for an extra charge). 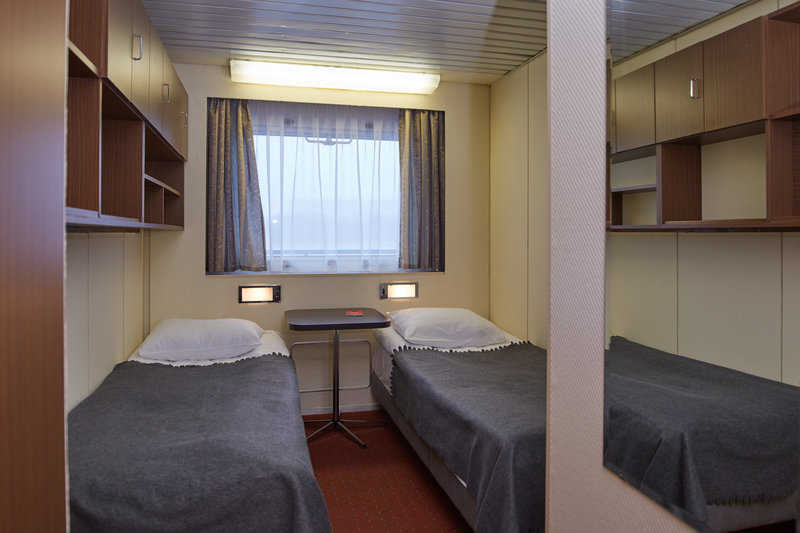 Each cabin is equipped with air-conditioner, bathroom (sink, shower, toilet), electrical socket (220V), built-in wardrobe, refrigerator, portholes on the Lower deck, panoramic windows on all other decks. A cabin for two persons located on the Boat deck. The cabin has scenic windows, private facilities (shower), kitchenette, a double bed, a sofa, a table, a TV, a refrigerator, and a hair-dryer. 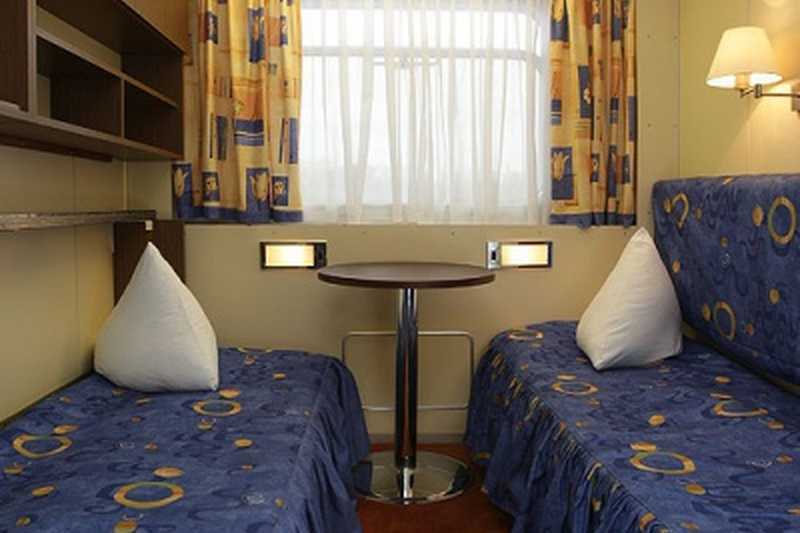 A cabin for two persons located on the Boat deck, with 2 twin beds which can be put together upon request and a fold out sofa. 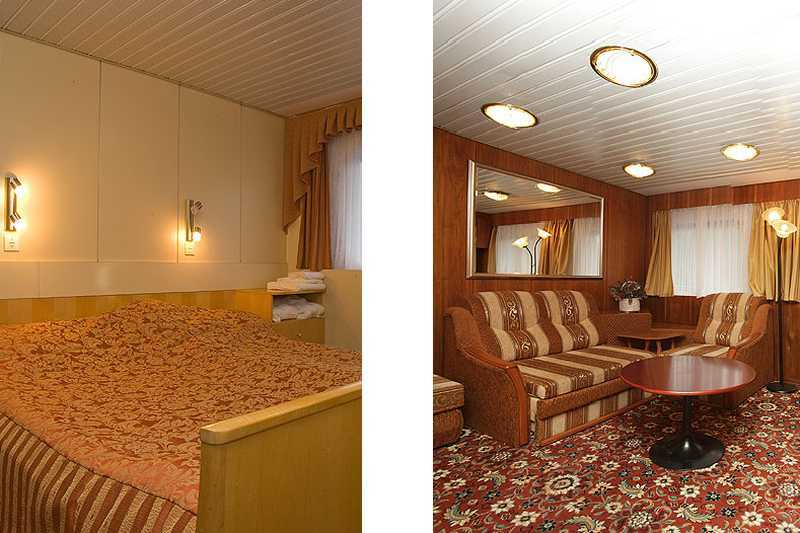 The cabin has scenic windows, private facilities (shower), kitchenette, a table, a TV, a refrigerator, and a hair-dryer. 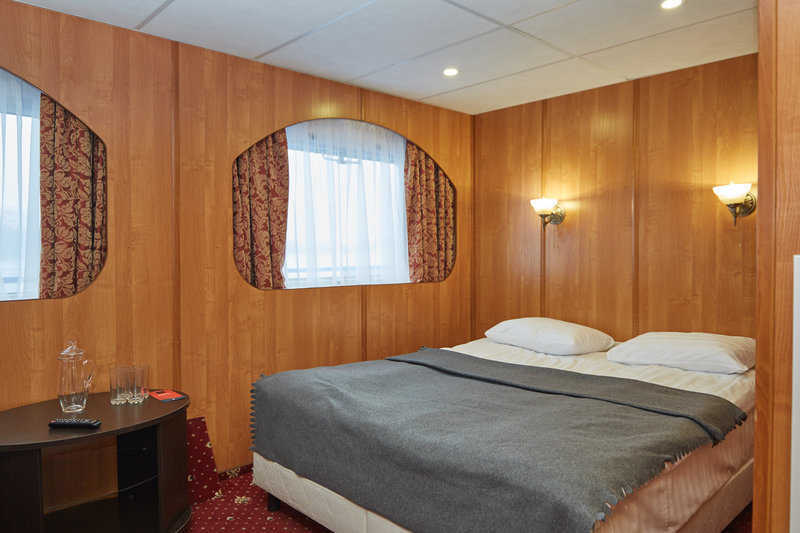 One-bed outside cabin with a large scenic window, equipped with private facilities, heating and ventilation system, and a TV. Cabin is furnished in a practical style. Two-bed outside single-staged cabin with a large scenic window, equipped with private facilities, heating and ventilation system, and a TV. 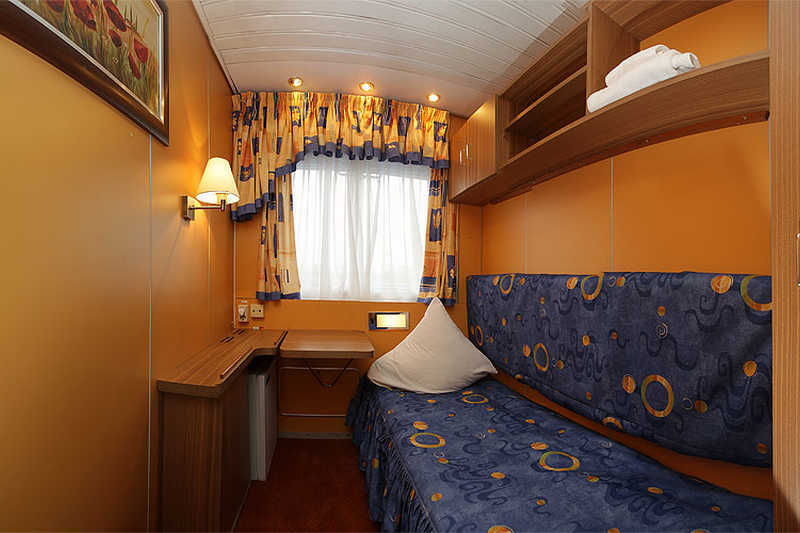 Cabin is furnished in a practical style.